Be a part of Tonawanda Tomorrow and help grow Tonawanda's economic future. 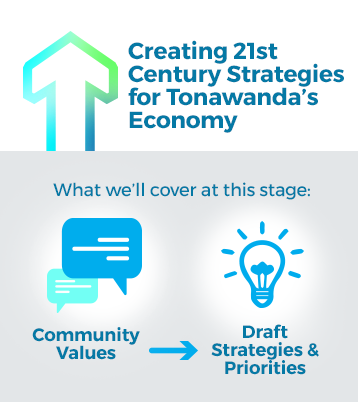 Tonawanda Tomorrow is a community-driven effort to create an economic action plan grounded in data and shaped by residents and businesses. 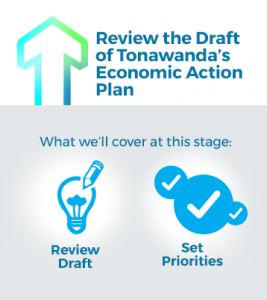 Starting in the Fall of 2016, Tonawanda Tomorrow will drive a process for creating an economic action plan that is grounded in data, shaped by residents and businesses, and deepens Tonawanda’s role as a key regional economic hub. Get involved in the process by attending a meeting, taking the survey or exploring resources. Stay informed by signing up for updates on the work. Be a part of Tonawanda Tomorrow and help grow the town’s economic future. Read the Plan for Tonawanda Tomorrow today! We’ll start by looking at what the data tells us about the Town’s economy and where it’s headed. We’ll look to past planning efforts and hold new conversations with residents to understand what the people of Tonawanda value. Together, data and community values will guide decisions and strategies for the Town’s economic future. Help us get the word out about upcoming opportunities to get involved. Our Outreach Toolkit has flyers, sample social media posts, web badges, etc. for spreading the word about Tonawanda Tomorrow. Community stakeholders, subject matter experts, and regional economic development leaders will work to assess the town’s role in the region’s economic landscape and identify strategies best fit to grow our economy. With community values in mind, draft strategies will be developed to address the town’s needs and goals for the future. After months of number crunching and insightful community conversations, we’ll gather to review the refined strategies and set priorities. Work will be geared towards crafting a plan for action and tools that help the Town realize its vision for the community. 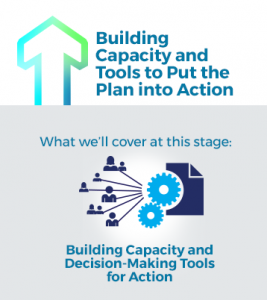 You’ll have the opportunity to tell us what you think as we begin to focus our efforts on implementation. Moving plans into action requires bringing all hands on deck. We’ll celebrate the work and people who have been a part of the process and discuss how we’ll work together to grow the Town’s economy for tomorrow. Attend June’s gathering to celebrate the work and understand ways we’ll put it into action.